The Machine Gun Corps is probably one of the most difficult Great War units to research. It was one of the few “war raised” units, having no existence prior to the conflict, and suffering the ignominy of being disbanded entirely in the years immediately following. Researchers find it hard to understand why such a vast organisation (well over 100,000 serving soldiers, plus officers, at it’s highest strength) should have left behind so few tangible records. 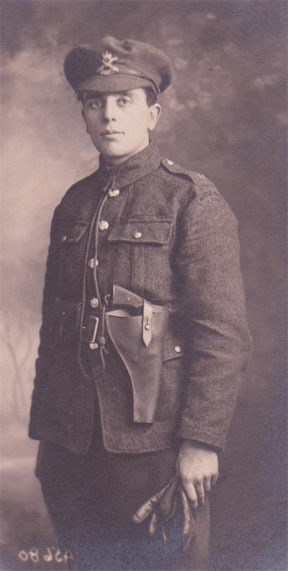 It has been suggested that the army “establishment” wanted to quickly forget that the Corps ever existed - it had, after all, taken away from the long established infantry regiments some of the very best and cleverest officers whose skill at arms, in mathematics, trigonometry and calculus would become such an asset in the operation of the Vickers machine guns. It starved the line regiments of recruits, taking the fittest and the best to try and satisfy the demand for more, and yet more, intelligent young men to man the guns. It succeeded beyond the wildest dreams of its conception, becoming in two short years a model of ruthless efficiency and operational supremacy. Little wonder that its demise was looked upon with satisfaction in some quarters. Conveniently, perhaps, all of its operational records, its establishments and regimental orders were totally destroyed in a mysterious fire which took place at the last Headquarters of the Corps, at Shorncliffe, near Folkestone in 1920. Not a single sheet of paper survived and even the partly written history of the Corps was lost. No attempt has been made to put right this omission until recent years. This disaster, together with the loss of so many personal enlistment files in September 1940, during the blitz on London, has made the job of researching MGC soldiers an enigma for the average genealogist. Official figures suggest that about 35% of original files still exist, but “in depth” research into those held by the National Archives (and available on-line via Ancestry) reveal that, in respect of the MGC, only about 20% can be found. Of these, a significant number are duplicated, leaving a net percentage nearer to 15%. The chances of finding a specific file is in the order of one in six. The concept of the MGC Research Database was to bring together in one place, in one format, as many facts, however minute, in respect of any soldier who once wore the badge of the crossed-Vickers guns. In doing so, and by using a professional computer archiving system, a totally unique reference tool has slowly been built. Data from this archive can be merged and manipulated in a way which can provide answers to questions that no other storage medium can attempt. Many thousands of hours have gone into building the database, which currently contains some information on over 100,000 former MGC personnel. The project is live and ongoing - new records are being created daily and will continue far into the future. We welcome contributions (particularly photographs) submitted by the descendants of our former soldiers, all of which are faithfully recorded for posterity. During the past years, the Machine Gun Corps Research Database has given financial support to the MGC Old Comrades Association. The Association has been in existence since the end of the Great War. Its original function was to help ex-soldiers who had served with the Corps to settle back into civilian life, and to keep them in touch with their former comrades. It also provided limited assistance to those who fell upon hard times throughout the 1920s and 1930s. 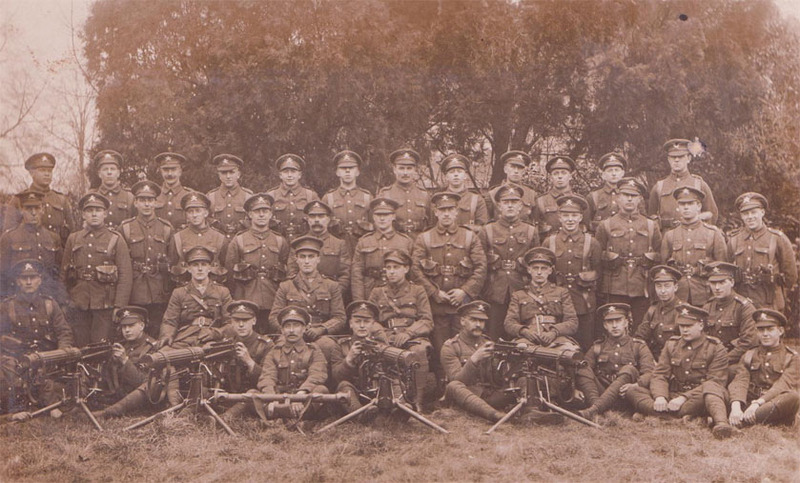 In more recent years with the dwindling numbers of old-soldier members of the Association, its continuity focused upon their families and descendants, together with those having a genuine interest in research and the history of the Machine Gun Corps. A major part of its work today is perpetuating the memory of the gunners by organising or taking part in regular memorial services and gatherings, which have always been popular. Click here to visit the Association website. Our support for the Association continues unchecked. The MGC Research Database will respond to any enquiry about a soldier - officer or other rank - and will provide whatever information is held within its files. Advice will be given about further avenues for research. Charges for information supplied are modest when compared with those levied by professional researchers. A fee of £10 is required to initialise a search. It should be noted that even a very rare “no trace” result will have involved a considerable amount of work. Please arrange, therefore, to have your search fee accompany any enquiry so that we can start work immediately. If a substantial amount of information is provided, the total cost may vary between £20 - £30 depending upon the time taken in putting together a service history, copying documents, postage etc. The cost of enquiries from outside the UK will reflect the higher postal charges. We will advise you in advance if we feel that more than the initial fee is justified.